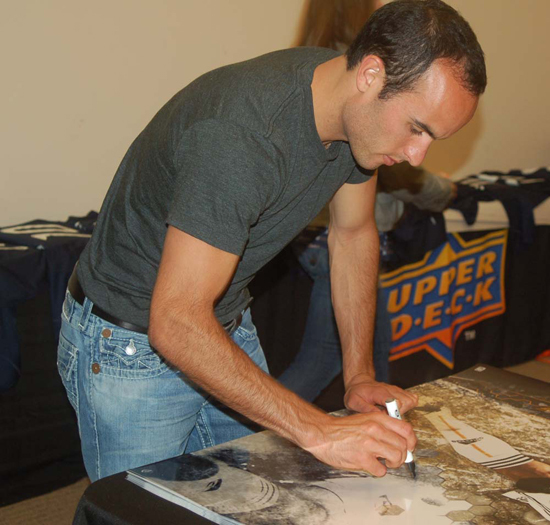 Carlsbad, CA (April 21, 2011) – The Upper Deck Company, the worldwide leader in sports trading cards, and its coveted memorabilia division, Upper Deck Authenticated (UDA), are both pleased to announce that Los Angeles Galaxy soccer star Landon Donovan has signed multi-year contracts to represent both entities as an exclusive spokesman. 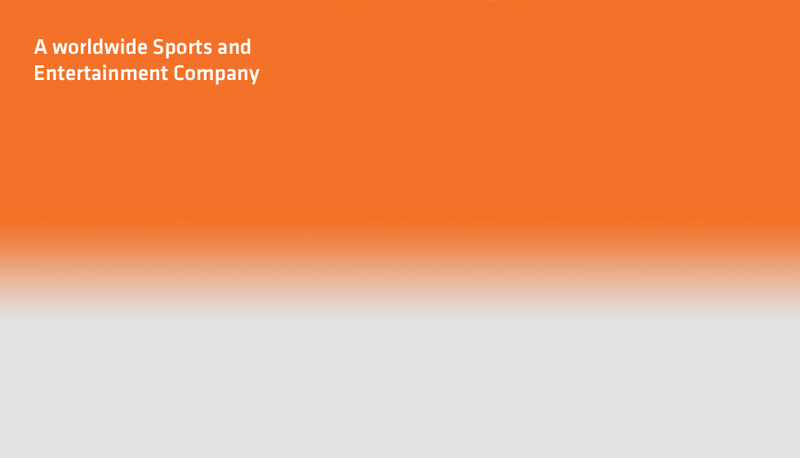 The agreements mean that Upper Deck and UDA will be the sole providers of autographed trading cards, memorabilia and game-used equipment from the world-renowned Major League Soccer standout. The 29-year-old winger/striker for the Galaxy joins fellow superstars Michael Jordan, LeBron James and Tiger Woods as an exclusive spokesman for Upper Deck and UDA. Already boasting a household name, Donovan’s persona took another leap into the stratosphere last July when he led the United States National Team to the coveted Round of 16 in the 2010 FIFA World Cup. It marked the first time since 1930 that the U.S. team had won its World Cup group and it was Donovan’s goal in extra-time against Algeria that made it possible. For the U.S. National Team, Donovan is the all-time leader in goals and assists and he is a seven-time winner of the U.S. Soccer Player of the Year award. His three goals in last year’s World Cup also made Donovan the highest-scoring American in World Cup history. A competitive MLS player since 2001, Donovan has tallied 71 league goals in six seasons with the L.A. Galaxy and he notched the 100th goal of his MLS career in August 2010. One month later, Donovan became the Galaxy’s all-time leading scorer and he has served as the team’s permanent captain since 2009. Donovan appeared prominently inside last year’s Upper Deck Soccer set, and once again headlines this year’s collection, which is scheduled to hit store shelves later this week. 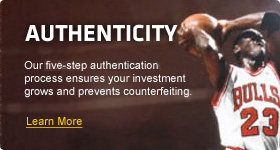 On the UDA side, which follows its patented five-step authentication process with each signature, Donovan has a robust assortment of autographed pieces available. 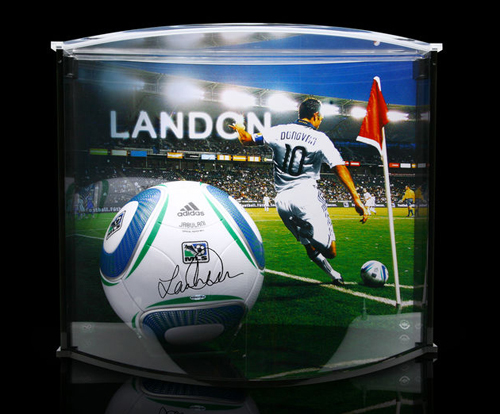 Initial items include FIFA World Cup and MLS Match soccer balls; 8” x 10” and 16” x 20” photos; L.A. Galaxy jerseys; and special, limited-edition items including UDA’s patented “Breaking Through” displays, which showcase an action print of Donovan in mid kick with a soccer ball actually breaking through the frame’s Plexiglas to provide an eye-popping, 3-D effect. In fact, Donovan participated in his very first UDA signing session just yesterday. All of these items are for sale at Upper Deck’s online store (www.upperdeckstore.com) or by calling 1-800-551-8220. Look for additional autographed and game-used items spotlighting Donovan’s career coming in June.